So, around Thanksgiving ‘Space Rogues ‘ was ending it’s 90 day run on KDP Select. I was hemming and hawing whether I should just re-up or take a break. As it happened there was a bookfunnel.com giveaway set up for Sci-Fi books that started 2 days after my KDP enrollment ended. Since I’m still hovering below 10 reviews (Have you read ‘Space Rogues’ and not left a review?) I decided to join the giveaway. Why not? It’s hard to draw any actual conclusions, from this stuff, but here are some numbers. Giveaway wise, I feel like it was a success. 371 total downloads seems good. Hopefully, 5-10% of them will leave a review, which is all I can hope for since my bookfunnel account doesn’t capture email addresses. The giveaway ran 11/17 – 12/3. Because there’s always a downside, was that being out of KDP select made it very clear, that most of my ranking WAS Kindle Unlimited. I left KDP select on the 24th and things went downhill fast as you can see. During my time outside KDP Select I was still running ads and of course the ebook and paperback were still for sale. Its evident that being discoverable via Kindle Unlimited was a huge factor. 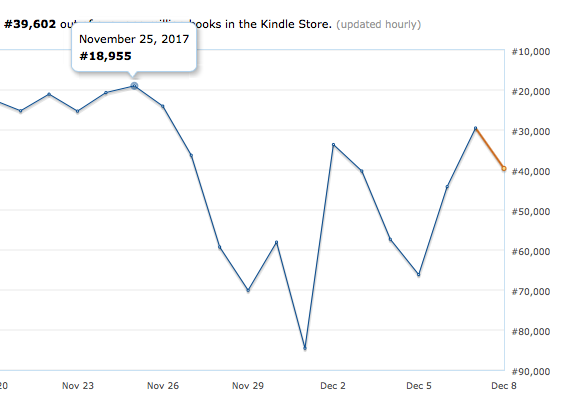 You can see below that even now, sales (well, reads that it is, via KU) haven’t recovered, despite only being out of KDP select for just over a week. Interestingly the drop off is delayed. Folks who had the book already got to keep it and keep reading. Eventually, though, folks stopped seeing and grabbing a copy of ‘Space Rogues ‘. Even though it’s back on KU it seems I’m going to have to get back to work marketing it. Fun.